The Winter edition of Hospitals is upon us. In it we bring you news, views and articles on the world of hospital medicine. 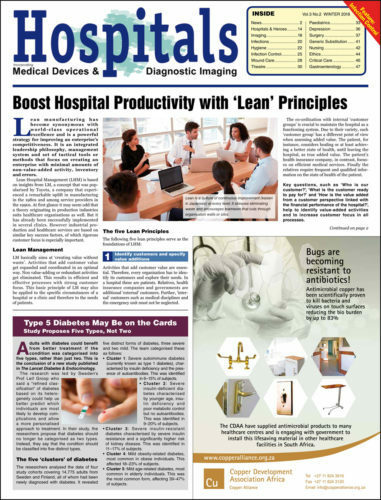 With a strong feature on Infection Control, the age-old bugbear in healthcare institutions both government and private, Find out all the latest news and exciting developments in the hospital world right here and right now. With it, we also remind you that we’ll be at both the SAMED conference (coming up next week), and the ICAN infection control conference (next month) and we look forward to seeing some of you there. For more info on both events, see the news section of this edition.